Haman was overjoyed at the special attention and honor Queen Esther had bestowed upon him. "Even the queen recognizes my importance! Who can compare to me in power and wealth!" he boasted. But as he left the palace he met Mordechai at the gate. Mordechai defied him as usual by not doing him homage, and Haman's anger rose just as his good spirits had risen a moment before. Haman quickly consoled himself with the thought that his revenge was certain and near. Haman rushed home and called a great family conference. When all his sons, wives, and advisers were assembled in his palatial home, Haman began to boast of all the honors that had been given him. "Look, even Queen Esther invited no other minister but me to her banquet with the King, and I am invited again tomorrow to dine with the King and Queen! Yet what are all these honors to me so long as Mordechai, the Jew, sits at the King's gate and never bows down to me? I cannot wait for the thirteenth of Adar any longer!" "We must devise a plan that has never been defeated before, for their G‑d always sends a miracle to rescue His devoted Jews. Beheading Mordechai will not do, for did not Pharaoh try to kill Moses by the sword, yet Moses's neck turned into stone! Nor will drowning be any good, for the Jews walked through the Red Sea on dry land, the waters having parted for them. Should we want to gore his eyes out, let's not forget what a blind Samson did to the Philistines! Equally useless would it be to burn Mordechai at the stake, for it was not so long ago that the three Jewish ministers of Nebuchadnezzar, Chananiah, Mishael and Azariah, walked out of the fiery furnace unscathed. Personally, I should have liked to see Mordechai torn to shreds by hungry lions, but everybody knows that the Jewish prophet Daniel went out of the lion's den unharmed and saw his adversaries thrown into it and torn to bits in his stead. So now, my wise men, think hard, and devise an execution that has never before been prevented by the Jewish G‑d." "Let us hang Mordechai! I know of no Jew that has ever been saved from the gallows. Now, let a gallows be made, fifty cubits high, and in the morning go to the King and ask his permission to hang Mordechai thereon. Surely the King will grant you such a little favor! And then you can go merrily with the King to the banquet!" Haman was delighted, and he wasted no time in erecting the gallows, fifty cubits high, in his own courtyard. "On that night the King's sleep was disturbed . . "
On that night there was a great clamor in Heaven. The tears and prayers of the distressed Jews, their sincere repentance and true remorse, broke through all the gates of Heaven. The angels, in great consternation, asked one another, "Is G‑d truly going to destroy the world?" No one slept that night. Mordechai and the Jews spent the whole night in prayer and supplication to the Almighty. 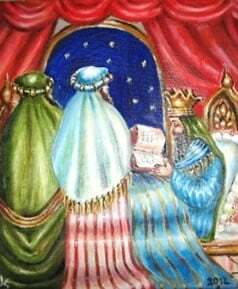 Esther was busy preparing for the banquet for the King and Haman; even the wicked Haman did not sleep that night, for he was busy erecting the gallows for Mordechai. Only King Achashverosh slept a quiet and undisturbed sleep. When G‑d saw Achashverosh sleeping so peacefully, he said to the Angel Gabriel: "My children are in mortal danger, and this fool is sleeping unperturbed. Go disturb his rest. " The King suddenly awoke, and could not fall asleep again. A grave suspicion crept into his heart: Why did Esther invite Haman to the banquet? Were the two plotting against him? Achashverosh tossed about on his bed, trying to drive his fears away. "Surely there must be a faithful servant in the palace that would warn me of any danger," he thought, "unless, indeed, I have neglected to reward him fittingly!" "Shamshi!" the King called, "bring the Royal Book of Chronicles, and read to me of recent events in the palace! Hurry!" Shamshi, Haman's son, who was the chamberlain in attendance that night, brought the book and prepared to read to the King. As Shamshi opened the book, his eyes fell upon the story of how Mordechai saved the King's life, when he uncovered the plot of Bigtan and Teresh. Quickly Shamshi turned to another page, but the leaf turned itself back again. King Achashverosh, who was becoming impatient with Shamshi's fumbling, cried, "Why are you turning the pages back and forth? Read on, delay no longer!" "My eyes are failing . . .," said Shamshi in a trembling voice.
" . . . In the seventh year of the reign of the mighty and illustrious King Achashverosh, long may he live and prosper, two treacherous chamberlains, Bigtan and Teresh the Tartians, were discovered plotting against the life of the great and illustrious King Achashverosh . . . The loyal Chief Chamberlain Mordechai the Jew, recently appointed head of the King's personal attendants, having overheard the plot, reported it to her Majesty the gracious Queen Esther . . . The Queen recounted the plot to his Majesty the King . . . The two knaves were caught red-handed passing poisoned wine to the King in the royal goblet. . . They confessed that they were driven to their act of high treason by having been subordinated to Mordechai the Jew, upon whom they hoped to cast the blame. Bigtan and Teresh were hanged forthwith . . . The faithful and loyal Chief Chamberlain, Mordechai the Jew, should be rewarded at the earliest date . . ."
So beautifully did the angel Gabriel read the story, and so soothing did the mention of Mordechai's name sound, that the King was lulled into a deep sleep in which he had a frightening dream. The King dreamed that Haman was standing over him with an upraised sword. Achashverosh awoke with a start. In the hall he heard approaching footsteps. "Who is there?" called the King. "Then it was no dream after all . . .," thought the King to himself, and to the servants he called, "Let him enter!" "Tell me, Haman, my wise counselor, what shall be done to the man whom the King wishes to honor?" Haman's heart leaped for joy. "The King wishes to honor me" he thought. "And it's about time, too." But assuming an air of indifference, Haman said modestly, "The man whom the King wishes to honor should be arrayed in the King's own apparel; he should wear the royal crown upon his head, and he should ride through the streets of the city on the King's own horse, while the highest minister of state should run before him announcing: 'Thus it is done to the man whom the King desires to honor! . . ."
"So," thought the King, "the villain has indeed designs upon my crown!" "Make haste, Haman, go and do all this to Mordechai." The words came like a thunderbolt, leaving Haman speechless. "Don't stand there like a mule!" the King cried impatiently, "Hurry, do all this honor unto Mordechai!" Haman pretended not to understand the King. "Which Mordechai?" he asked. "Mordechai the Jew, of course!" answered the King. "But there are many Jews by that name," complained Haman. "The one that stands outside the palace gate, you idiot!" "He!" cried Haman tearfully, "He is my sworn enemy. I would rather give him ten thousand silver pieces than do him this great honor!" "Give him the money, indeed, but honor him in the manner you described." "But, your Majesty, why bestow such honor upon a Jew?" "What insolence!" cried the King. "Is it not enough that Mordechai saved my life? Now, enough of your wrangling. Go to Mordechai at once, and follow my command to the letter, if you value your life at all!" The Complete Story of Purim, published and copyright by Kehot Publication Society, Brooklyn NY. Ahuva Klein is an artist and teacher living in Israel. Her artwork, which is primarily Biblical and Judaic, has been exhibited in Israel and abroad. The fascinating story of Mordechai and Esther and their triumph over the treacherous Haman, based on the Megillah, Talmud and Midrash. Funny details I thought it was funny when Haman pretended to not know who Mordechai was. Esthrer and Mordecai I visited Hamedan in Persia and saw the tombof Esther. Can you comment on this? I did take a picture of the outside and some of the inside. I also met a man who had lived in the town all his life and said that when he was a child, a good half of the town were either Jewish or Christian. I also saw a restored church, but I am not sure if there was a congreation there.